I will keep this week's post short due to time constraints. Gameweek 27 saw my team rise a healthy 140,000 places. I need more of that if I want a better overall rank. I decided to buy Schmeichel due to his good run of upcoming games (Leicester defensive coverage was a must for me) - the same wasn't true for Hennesey (including his woeful form) and he has a blank in Gameweek 30. 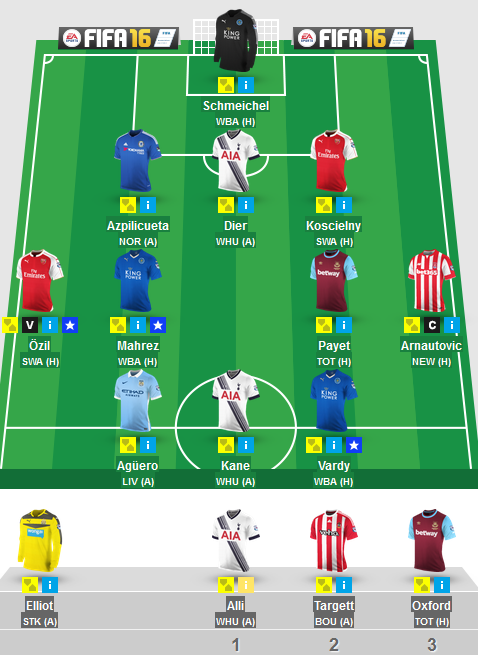 As for my captain, I have taken somewhat of a risk in opting for Arnautovic. Newcastle have been leaking goals on the road of late and Stoke have scored 5 in their last two league games. It just felt right to give the armband to "Arnie" following his brace against Villa. Yes, it's a huge risk but I'm chasing right now and need to think outside the box. Labels: Weekly Fantasy Football Show (FanFeud): GWs 28 & 29. I hope you all had a pleasant break from FPL and watched loads of cup football. Now that is over for the time being, let's turn to this weekend's Premier League action with the first truncated Gameweek of the season as a result of the league cup final. Put simply, I was tempted to sell Barkley and once it was confirmed that he wouldn't play in Gameweek 27 or 30, it made sense to buy a replacement who would. This led me to in-form Tottenham and their OKish run of games. I have been mulling over two options as my potential transfer - Alli and Eriksen. On corners and free kicks. Despite being 50-50 on paper, for the most part I really wanted to buy Eriksen but ultimately chose Alli as I knew I wanted a Leiceser defender in the weeks ahead. I wouldn't be able to acquire one unless I took a hit had I bought Eriksen. In addition, Alli's high ownership means that I had to buy him even if it was for the sake of "blocking tactics". It also means that I have effectively got a "templified" midfield. 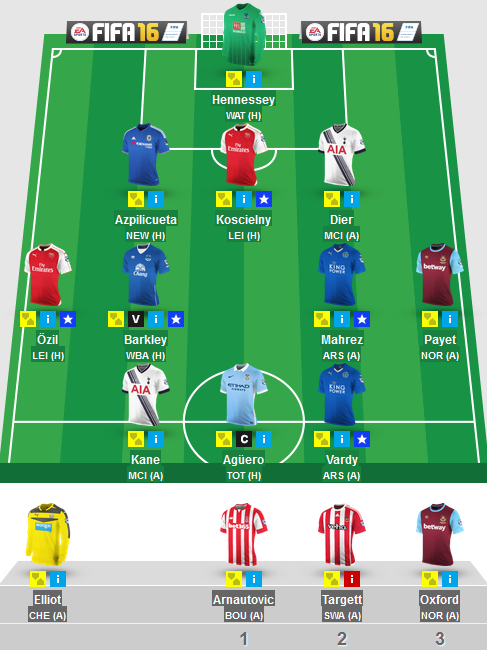 Other than that, I chose Vardy as my captain due to Norwich's awful away record. I was also tempted by Kane but Swansea can be tough on the road. It will get worse, before it gets better? I certainly hope not! Gameweek 26 led to a 4th consecutive red arrow. Only once have I seen green in 2016. I need that to change, pronto. The purchase of Baines a few weeks back was nothing but a failure on my part. This hasn't been helped by the fact that Targett and Oxford sit on my bench, which resulted in my team only fielding 10 players over the weekend with a score of 59. 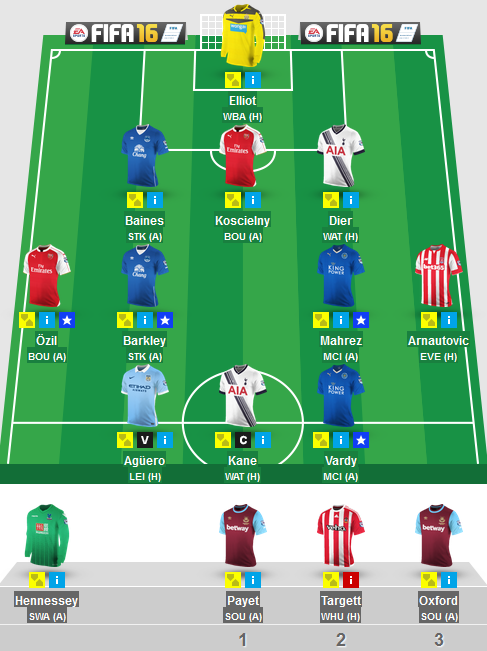 I really should have captained Aguero too. Looking ahead... aside from form, I wanted to sell a player who had a blank in Gameweek 27 and buy a player who didn't. Baines' no-shows have proven costly to my team - all the more worse with Everton keeping clean sheets. I have no plans of selling off my front 7 just yet, so I had to focus on my rickety defence. Azpilicueta made sense as Chelsea have started to keep clean sheets (albeit more so away) and Newcastle have struggled to score on the road. As for my captain, 6 goals in his last 4 PL games and penchant to score goals against Spurs (even with their recent solid away form) it had to be Aguero. Here's to hoping. Sorry in advance if I mess up (again)! Not much to say this week other than the fact that I bagged a third consecutive red arrow and as a result I have tumbled out of the Top 1 Million. Aguero's last minute yellow card cost me 8 virtual points and any chance of an upturn in my rank. I guess it serves me right for only having him as a vice-captain for the previous two weeks. This week's transfers were knee jerk and done in rage. I wanted to bring in players that have shown short-term form and have scored lots of goals this season. Patience with Lukaku subsided as a I welcomed Kane as a natural replacement (he also doesn't have a blank fixture in Gameweek 27). I was also looking to increase spare funds in the bank in the hope of upgrading Ozil to Sanchez sooner rather than later. Out went Giroud and in came this year's golden boot candidate, Jamie Vardy. He has a cracking run of games from Gameweek 27. Kane makes sense as captain. Good luck to you all. Folks, it goes without saying, my FPL team has had a shocking 2016 to date. In fact looking at the season as a whole, I've had rotten luck with captain picks. I used to average 60 points per Gamweek in previous seasons, I'm miles off that. I'm lucky to be still ranked in the Top 1 Million (just about). I was hoping to use my "mini-wildcard" (2FTs and a -4) after the cup break, but to my frustration the players that I wanted to sell scored! I wanted to bring in Sanchez but the truth is that I'm already stretched on a "Pound Shop" level at the back and I need to unlock some equity from my team, pronto. 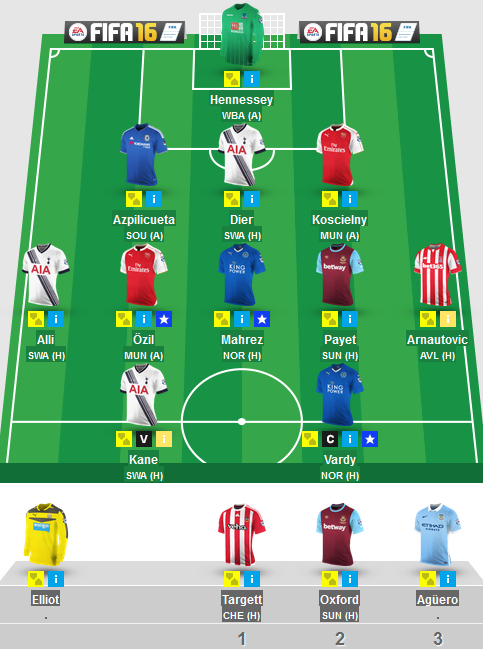 I have lost patience with the goalies, Giroud, Arnautovic, Dier and Lukaku. They are all on my bin list. But I can't sell any of them just yet. I decided to sell R Bennett after he lost his place in the Norwich team. I was contemplating Borthwick-Johnson as a viable replacement but he isn't guaranteed a starting place beyond Gameeweek 24. I also looked at Swansea's Rangel and their upcoming games, but he was also somewhat of a risk. I decided to buy Targett due to his cheap price and sensational form. Best of all, I gained £0.1M by selling the now defunct R Bennett. I don't mind benching Targett against Arsenal. If I retrospectively opted for my vice-captain over my captain this season, I would have acquired far more points than I currently have. 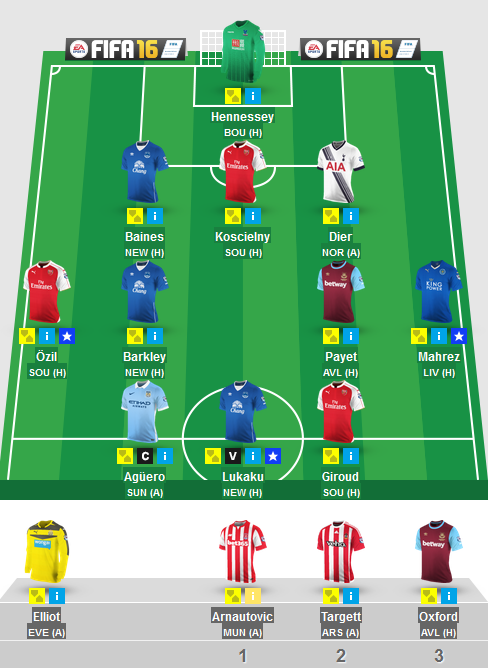 I was tempted to go with Lukaku but his form has been diabolical of late. It has to be Aguero - The "Shield Captain". City need a win. City need goals. What better way for Pellegrini to leave in May by winning the Premier League? It's within his grasp. You can't look beyond Aguero when he is scoring regularly. Here's to hoping. Good luck!